Are robots taking over your job? The use of robots has commonly been found in manufacturing jobs but recent trends have shown that they are now also being used in customer-facing roles in the service sector. 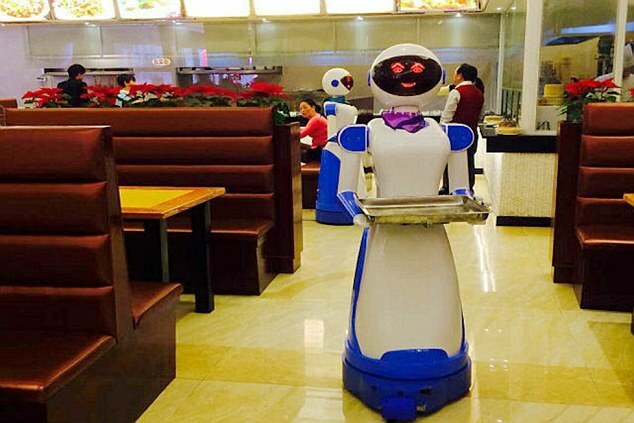 Countries such as Japan, China, the US and Germany are leading the way in using human-like robots in hotels, stores, and restaurants, and one researcher said the main reason they are doing so is because it cuts personnel costs dramatically. “But many companies are deploying robots in an unreflected manner, without knowing beforehand what these changes mean for either employees, corporate culture, or customer relationships,” said Ruth Stock-Homburg, a professor at the Institute of Marketing and Human Resource Management at TU Darmstadt, a research university in Germany. To see how well robots can integrate with human co-workers, Stock-Humburg and colleagues asked more than 400 managers and employees in Germany and the US about how much in favour were they of robots in their workplace. The general idea of having human-like robots in the workplace was favorable with 82% saying they would consider them as valuable support in performing daily tasks. “However, in this case the robot is expected to perform rather repetitive, unpleasant tasks, such as filing and documentation, appointment bookings, and messenger or research services,” they told Science Daily. In fact, given the opportunity, 21% of the respondents said they would rather work with robots than with human colleagues because “they have lower error rates, higher predictability, and continuity in behaviour”. Yet a majority of respondents said they would distrust a robot who shows any sort of ‘emotion’. “Otherwise, I would turn that thing off,” said one respondent, while another said that robots should only make programmed decisions and their autonomy should be limited. Respondents said robots would be of great help during meetings to take notes and act as a company database that can immediately provide facts. Researchers also reported that respondents “suspect robots to be unable to link complex issues or have detailed conversations with employees”. Would robots make good leaders? Most respondents don’t think so as only 15% of Americans said yes and only 8% of Germans. Respondents said robots won’t make good bosses because they would not be able to empathise with the employee’s family situation or other concerns that radiate into the job. “A machine cannot judge a man … and cannot serve as role model,” said one respondent. On the other hand, those that do believe in ‘robo-bosses’ say they would lower error rates and would be subjective. “Robots are just and less moody,” said one. Stock-Humburg concluded that robotics will make many classic jobs expendable. "But new and more conceptual jobs for our future generations will automatically be created. Companies should elicit these future jobs at an early stage and create new occupational fields before deploying robots," she said in The Darmstadt Future of Work study, adding that companies that do embrace this would be more successful.